Telecoms group TalkTalk has completed its move to Salford Quays, bringing together almost 1,500 staff from two separate offices into a new state-of-the-art building, the Soapworks. The move follows a two-year re-fit of the former Palmolive/Colgate building on the banks of River Irwell. Spread over five floors, the 106,000 sq ft space features mobile meeting hubs made from clear writeable glass, an industrial-inspired café with views of the Manchester skyline, a roof terrace and picnic heath. The company, which saw revenue fall 3% to £1.78bn in the year to March 31 but EBITDA up 17% to £304m, said a key reason behind its decision to move was "the opportunity to build links with a wide group of universities and colleges" to promote careers opportunities for apprentices and graduates. 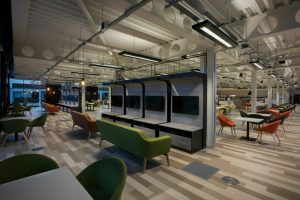 Mark Dickinson, TalkTalk’s chief people officer, said: “Making TalkTalk an even better place to work is a key priority for us and we are proud to be investing in our colleagues, as well as in our new home. As a technology company, it’s important that our working environment reflects our digital first culture. TalkTalk is retaining its other sites, including London, Stornoway and Gateshead.